A face wash free from harsh chemicals. Salcura Antiac Daily Face Wash is made with powerful natural ingredients to gently cleanse and clear the skin of impurities. Used daily as part of your skincare routine, Salcura Antiac Daily Face Wash will help to keep your skin nourished, clean and free from spots. 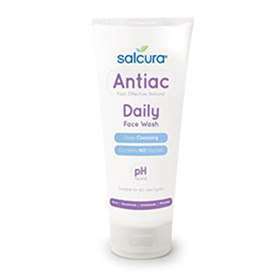 Salcura Antiac Daily deep cleansing face wash is free from harsh chemicals such as benzoyl peroxide, steroids, antibiotics, hormones, alcohol and parabens. Instead, it harnesses the natural goodness of Sea Buckthorn - a 'super ingredient' that has the proven ability to target infections, cleanse skin and soothe inflammation. Antiac's unique formula also contains Sunflower Oil and Rosemary, which form a protective barrier to help keep pores free of bacteria and impurities, Bisabolol (derived from German Chamomile) to calm red, inflamed skin and soothing antibacterial Aloe Vera. The Antiac Daily range is suitable for all skin types and is best used every day to help maintain clear skin and reduce instances of mild outbreaks of acne, including blackheads, whiteheads and pimples. Combats acne, pimples, white & black heads. Free from benzoyl peroxide, antibiotics, parabens, lanolin, sulphates, hormones, alcohol and steroids. For best results, use daily in the morning and evening. Squeeze a small amount into clean hands and massage gently into the face. If product gets into the eyes, rinse away thoroughly with clean water. Aqua, Caprylyl/Capryl Glucoside, Coco-Glucoside, Hippophae Rhamnoides Kernel Extract, Rosmarinus Officinalis Leaf Extract, Aloe Barbadensis Leaf Juice Powder, Healianthus Annuus Seed Oil, Acrylates/C10-30 Alkyl Acrylate Crosspolymer, Phenoxyethanol, Polyglyceryl-3 Caprylate, Glyceryl Laurate, Polyclyceryl-4 Caprate, Panthenol, Potassium Hydroxide, p-Anisic Acid, Arginine, Bisabolol, Zinc PCA, Alcohol Denat., Parfum, Ethylhexylglycerin, Beta-Carotene.